Detectors | ALL-SAFE SECURITY, INC.
For wireless applications, a wireless door and window transmitter sends a signal to the panel wien the door or window is opened, closed, the transmitter battery is low, or the transmitter needs to be serviced. Transmitters can also be combined with flood sensors to notify the monitoring center of a flooded room. Motion detectors provide a second line of protection in case an entruder breaks through a window or enters via an unprotected route. Motion detectors are available in both hardwired and wireless configurations and are available with weight based pet immunity to allow pets to move freely, even when the alarm is set. Smoke detectors help to protect your family and your property by alerting our monitoring center to call the fire department in the event of a fire. 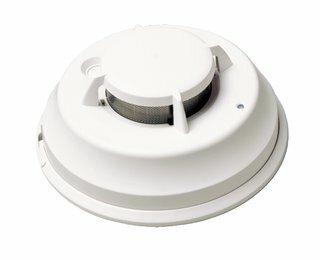 Smoke detectors are available in both hardwired and wireless configurations.